Please refer to our stock # TC394 when inquiring. This antique beaded headband is from Guang Dong province in China, and is typical of headgear worn by Chinese woman around the turn of the 19th-20th century. 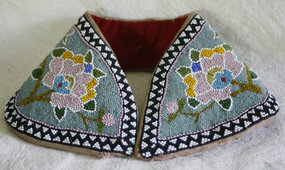 It would have been worn the narrow portion across the forehead, with the rounded flap portions covering the ears and fastened in the back of the head.